A native of Sheffield, England, Simon Stevenson moved to the USA 25 years ago. He studied at Johnson and Wales University, Rhode Island where he earned an A.A.S in Pastry and Baking Design (Honors). 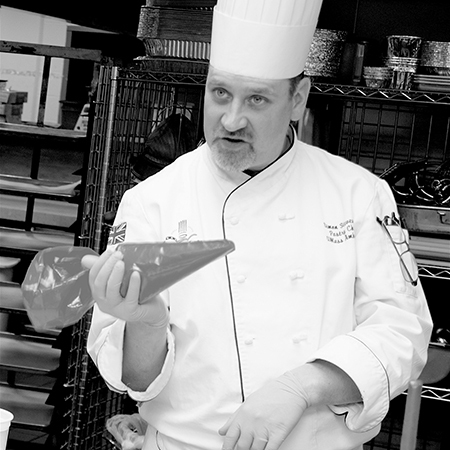 He has worked as a Pastry Chef in Boston hotels, The Nashoba Brook Bakery and Café, Concord MA, and was Department Head at The Connecticut Culinary Institute before taking his current position more than 13 years ago as Director of Baking Operations/Executive Pastry Chef at the Ivy Award Winning University of Massachusetts, Amherst. As UMass’ first ever Pastry Chef he has led the university Bakeshop in becoming one of the first trans fat free campus bakeries in the country. Chef has been at the forefront of including whole grains in more than 30% of UMass Bakeshop’s items and continues to develop new formulas with this initiative in mind. He has won several ACF gold and silver medals and is a recipient of the Menu Masters Award 2010. In addition to managing Bakeshop operations he teaches classes in baking and chocolate and manages the bee hives at the UMass Permaculture Garden. Chef Stevenson is a former presenter/co-host of the weekly PBS/WGBY television show “On The Menu” and “Connecting Point”. Simon enjoys reading, gardening, cooking, beekeeping and traveling. He lives in western Massachusetts, with his wife and two children.